While it is of utmost importance that a saddle fits the horse, it is also vital to ensure it fits the rider too! If you are not in the correct position and sitting comfortably you will not be able to ride to the best of your ability which can only be a negative when it comes to performance. The WOW saddle has a unique seat that is designed to make best use of the shape of our legs. The human leg is not flat on the inside of the thigh but has varying degrees of roundness and then a hollow at the very top. This shape is created by the top of the inner thigh muscle, the same muscle we use for “holding”. Most saddles give us nothing to hold on to, giving a totally smooth line running from the skirts over the stirrup bars down to the flap. The WOW has a deliberate step between flap and seat creating a hollow that the leg sits into on either side of the tree. This promotes more stability and security by giving the leg something to wrap around rather than sitting on top. Sitting trot on big moving horses is easier, jumping has greater security as the leg can mould into the saddle and horse. The seat is seamless having no skirts stitched on to the softer seat leather; this means less wear of the seat and of you. The seat is also formed differently to that of other saddles. Where some saddles are prone to rub the rider (ladies and gentlemen) you will find we have thought about this problem and by varying the softness and support density over the seat’s surface we have created an exceptionally comfortable seat. Don’t take our word for it, try a WOW Saddle for yourself and feel the difference! WOW Club Dressage offers your horse supreme comfort having the WOW tree with Lateral Flexion, Pointless panels and interchangeable headplates. 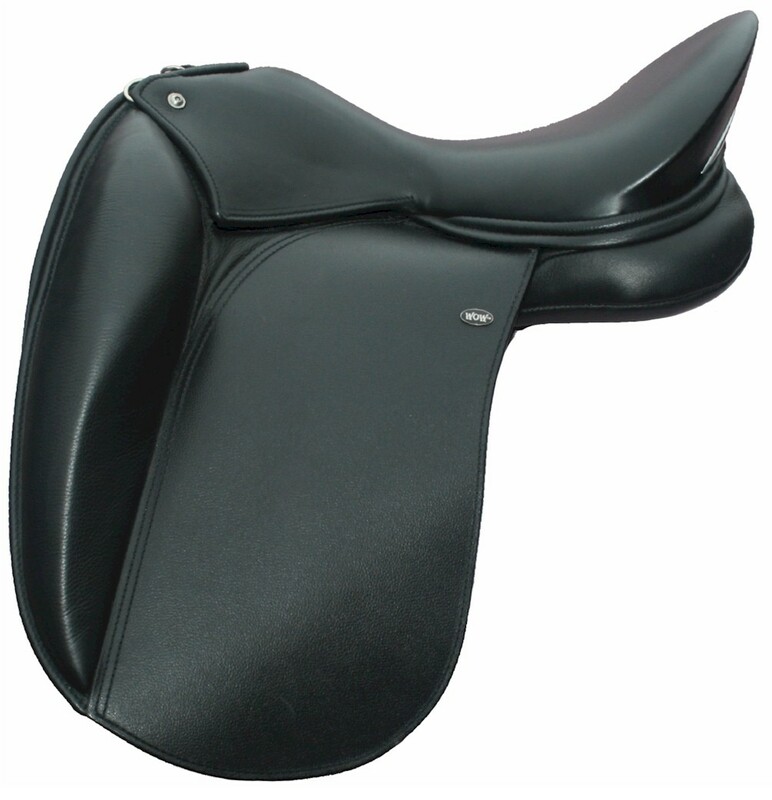 The Dressage saddle has a deep profile seat. 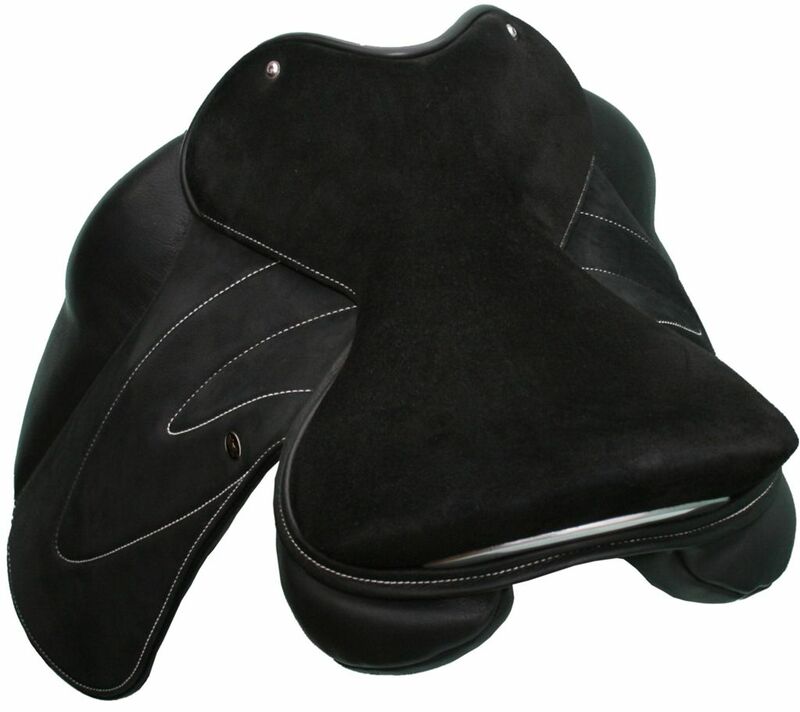 The Flap has soft fixed knee blocks giving the ultimate in rider comfort and stability and the WOW Double Stirrup Bar enabling the rider to move leg position depending on the length of their upper thigh and the level of work that their horse is achieving. Like the competitor the club flaps have the unique WOW girthing system and the optional fore girth can be added if required. The panels are available in soft foam which can be can be changed for different shape horses by the use of shims or upgraded at extra cost to the Flair system. The WOW™ saddle has a unique seat that is designed to make best use of the shape of our legs. The human leg is not flat on the inside of the thigh but has varying degrees of roundness and then a hollow at the very top. This shape is created by the top of the inner thigh muscle, the same muscle we use for “holding”. Most saddles give us nothing to hold on to, giving a totally smooth line running from the skirts over the stirrup bars down to the flap. The WOW™ has a deliberate step between flap and seat creating a hollow that the leg sits into on either side of the tree. This promotes more stability and security by giving the leg something to wrap around rather than sitting on top. Sitting trot on big moving horses is easier, jumping has greater security as the leg can mould into the saddle and horse.